Just trash. A bunch of teenage drunks that dont even half asss it. This is a two of noob players that cant get a group together that just trash talk d&d. They dont do any research and try to be experts at d&d lore. Lazy bunch of children. Welcome to The Dungeoncast! A Dungeons & Dragons 5th Edition podcast where co-hosts, Will and Brian, explore all things D&D including lore, game mechanics, and creative concepts. Whether it's a detailed discussion on the strangulation techniques of Black Puddings or our continual drawing of Demogorgon's attention, join us as we have casual, educational, and humorous conversation about the world's most popular tabletop RPG. Together we delve into the endless possibilities and unforeseen complications of character creation, role playing, and dungeon mastering. New episodes of The Dungeoncast will air every Monday on Youtube, Soundcloud or anywhere else podcasts can be found! The Dungeoncast presents a new one-shot actual play adventure (featured in full length at patreon.com/thedungeoncast) called The Vault Raiders and the Cult of the Dread Star! It is a direct continuation of The Vault Raiders and the Isle of Dread. This teaser will drop you off in the middle of the adventure, but don't worry. It's a real good time. Thank you to all of the supporters of the show - especially our beloved Patrons! You are all amazing and we appreciate the continued support. Special thanks to Josh Freeland playing Balazar Acidtooth (Dragonborn War Cleric), Jacob Quezada playing Matthias Stormshield (Air Genasi Fighter), and Dungeon Master Will Stark. You are all spectacular tabletop gamers and this project was a success because of you! The Vault Raiders is a D&D one-shot "Live Play" featuring Josh Freeland as Balasar, Jacob Quezada as Mathias Stormshield, Brian McDonald as Giselle Strongbear, and Dungeon Master Will Stark. This adventure is filled with the high seas, calming beach fronts, dread, luscious tropical jungles, dread, indigenous fish folk, magical rivers, and dread. The rest of the one-shot adventure can be found exclusively on our Patreon! 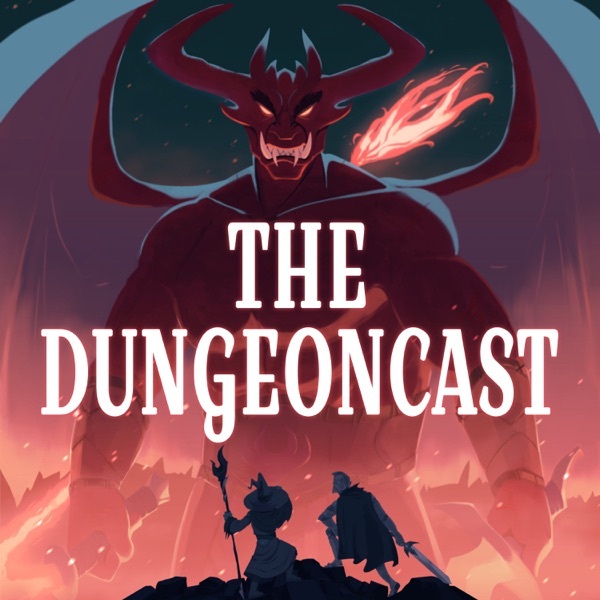 Come check it out at https://www.patreon.com/thedungeoncast and check out all of the content we have to offer! This week Will and Brian talk about the four elements embodied as a race of people known as the Genasi! Imbued with elemental magic, each different form of these diverse people display formidable powers and unique personality types. Talking points: Genasty, Djinni Talk, What Lies Between, Thick Whispy Locks, No Nobles - Just Rock Stars, Raised By Dwarves, Voted Most Likely To Heal, Making Changes. Will and Brian are back in the Fey on this week's episode of the Dungeoncast! This alien area articulates hypnotizing hues, illustrious illusions, and baffling behavior beyond common conception. It's better to know the lay of the land if one decides to wander through this hazardous expanse of mysterious beings. Talking Points: Old Timey Celtic, Mundane Weaknesses, A Slow Slide Into #feybullshit, The Fluff Is Real, Fey-lien, Inherent Magics, Behaviorism Breakdown. The Barbarian is a primal, rage induced warrior capable of demolishing opponents and eating all the damage in the front lines. Will and Brian let their instinct guide them to explaining what you need to need about this tanky battle machine. Talking Points: Previous Editions, In Depth Conan Analysis, Wisdom?, That Good Tank, Getting Reckless, Berserking, Totem Time. Will and Brian are going over the art of building an encounter as a DM/GM this week! From simple combats to more complex endeavors, learn what you can do to take your players to their limits. Talking points: Consequential Combats, Difficulty Ratings, Fail-State Boss Fights, Good Encounter Spice, Know Your Players, DM/Player Role Play, Skill Challenges, and more. Dark, dreary, drab, and definitely deadly - this week's episode covers the Shadowfell! We promise not to leave you in despair as we guide you through this seemingly horrific landscape full of mysterious and spectacular creatures. Join Will and Brian as this treacherous terrain is traversed on another edition of Atlas Exterus. Will and Brian get into some serious sorcery on this episode. Entities boasting raw innate power in fantastic fashion; Sorcerers are as fun to role play as they are to write backstory for. Come check out everything this class has to offer this week on The Dungeoncast! This Races of the Realms episode is all about the bold and brooding Tiefling. Will and Brian discuss the possibilities of creating one of the newer, more exotic, and even more controversial races. These infernal beings prove for an interesting role playing experience! Will and Brian talk all about goblins and their ilk on this episode. This classic creature of the fantasy genre boasts brutality and bloodshed - even amongst their own ranks. Tyranny, greed, The Jester, and more this week on The Dungeoncast! Want to smite something divinely? Want to heal or even buff your party? Will and Brian get into a full scope of possibilities for running D&D's powerhouse of prayer: The Paladin! A warrior sworn to uphold an oath - but to whom and to what ends? Find out this week on The Dungeoncast! Whether you find them in forests, towns, or deep in some tunnels filled with evils beyond imagination, Gnomes will be boasting +2 intelligence and some impressive advantage on saving throws. But there's a lot more to them than that! Will and Brian get into what makes a Gnome a Gnome this week on The Dungeoncast. Will and Brian break down the elements of building your very own town this week. Map layouts, forms of government, and commerce are some of the many elements of town building that are discussed; from the middle of nowhere to the borderline metropolitan! It's a meticulous (or not) adventure of its own. This week's episode is all about Dragonborn. Born of dragons? Probably. Breath weapon? Definitely. Will, Brian, and their Special Guest Jake discuss not only what a Dragonborn is in the world of D&D, but what it means to role play as one. Ever wonder where you go when you fail all your death saving throws? Will and Brian discuss some of the possibilities; from the more typical D&D pantheon to designs most mysterious. This weeks fantasy discussion is larger than fantasy life! Will and Brian are finally getting into Dragons - the evil ones! Clever and carnivorous creatures categorized chromatically; they're in a class of their own. Will and Brian tackle the concept of building a dungeon and everything it entails from the perspective of a Dungeon Master. Puzzles, mazes, monsters, and much more! It's time to get holy as Will and Brian get into the specs of a 5e Cleric. We put together a special introduction to shed some divine light on one of the more powerful features this class has to offer! Will and Brian talk about the Fifth Edition Halfling. It's nimble, fearless, and moving through your tiles! Will and Brian do a Class Breakdown of a 5th Edition Rogue.